Bangkok (Thailand) – August 28, 2018 (travelindex.com) – Tito’s partners with Well Hotel Bangkok Sukhumvit 20 throws a charity networking party to raise money for Soi Dog Foundation. Tito’s Handmade Vodka by Independent Wine & Spirit (Thailand) Co. Ltd. partners with Well Hotel Bangkok Sukhumvit 20 throws a charity networking cocktail party on Friday, 28 September 2018 to raise money for Soi Dog Foundation. Mix, mingle and make new friends while being entertained by tasty finger food, drinks, mini massage by Well Spa, funky groove music by DJ Tim from House Jam and the talented Antonio Pedrero Garcia on saxophone. There will also be lucky draws and a charity auction for hotel stays in Bangkok and Pattaya. 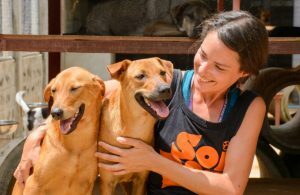 If you are looking for adopting a dog or cat, the Soi Dog team will be there with their Adopt a Pet booth. The Soi Dog charity networking cocktail party takes place at Well Hotel Bangkok Sukhumvit 20 from 5.30 – 9 PM on Friday, 28 September 2018. Enjoy free food from 6.30 to 9 PM and free flow Tito’s cocktails from 6.30 – 7.30 PM. Cash bar is available throughout the evening for special priced drinks. Suggested door donation is 350 Baht per person. All door proceeds, all Tito’s Vodka cocktail sales and parts of other beverage sales will go to Soi Dog Foundation. Vodka for Dog People, Tito’s is produced in Austin at Texas’ oldest legal distillery. An important part of the story at Tito’s Handmade Vodka is the innate connection with the canine counterparts. Since the beginning, Tito’s has been committed to rescuing and protecting the animals that have come into our lives, often serendipitously — many of whom now thrive alongside us at the distillery and office. Tito’s Handmade Vodka is designed to be savored by spirit connoisseurs and everyday drinkers alike. An award winning lifestyle wellness hotel, Well Hotel Bangkok Sukhumvit 20 is conveniently located in the heart of Bangkok and within walking distance from BTS Asok and MRT Sukhumvit. It is comprised of 235 rooms and suites, with five room types including Superior, Superior Corner, Deluxe, Executive and Executive Suite. The two latter room types are equipped with an exercise bike, yoga, Pilates and resistance exercise set. Well Fitness offers free daily exercise classes including Muay Thai cardio to guests. Other facilities include The Twist Bar & Bistro, Eat Well Café and Well Spa.